Tournament Manager is the fastest, easiest golf tournament software to run your tournaments. Easy to use, fast data entry, and flexible tournament management capabilities all in one package. Planning a golf competition? 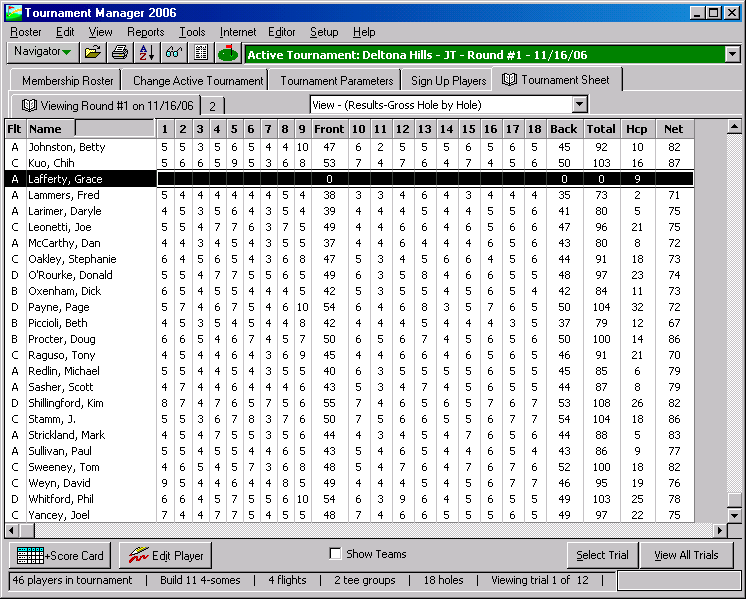 Run any number of tournaments with Golf Software's Tournament Manager. Mark participating golfers, build teams, and print pairings/score cards. Post score cards, and in seconds you'll have tournament results. 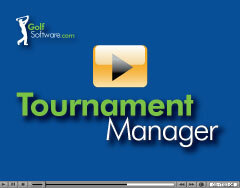 3 minute overview of Tournament Manager golf tournament software. More thorough demo of Tournament Manager. Takes less than 15 minutes to view. 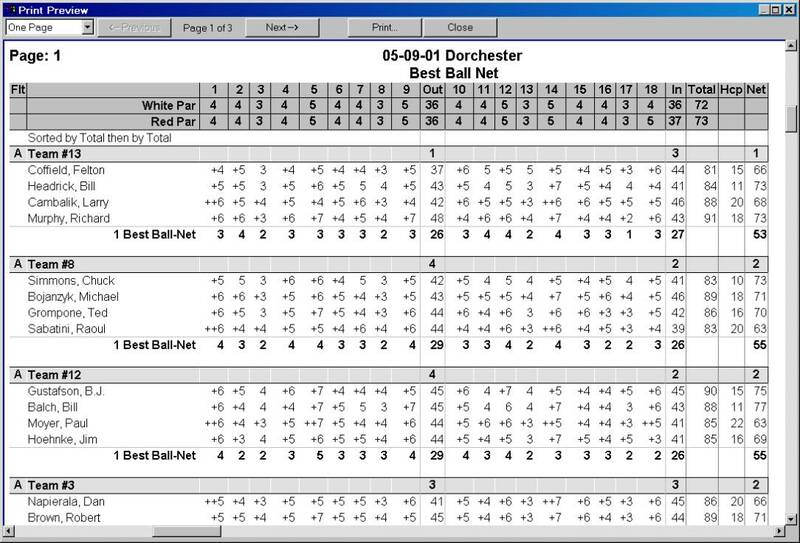 Get scorecards that make your tournament look more professional. Track your players' scores and handicaps. Integrates completely with the Tournament Manager. Mark participating golfers in the sign up sheet. Build the teams and print score cards or pairing sheets (optional). Post score cards and print tournament results (optional). 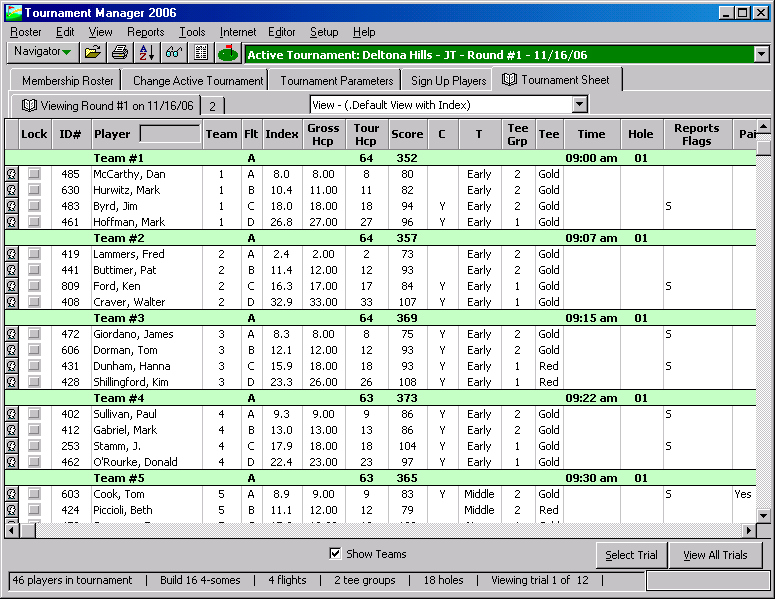 Tournament Manager was developed for tournament managers who are tired of pairing teams, marking score cards, and calculating results by hand. 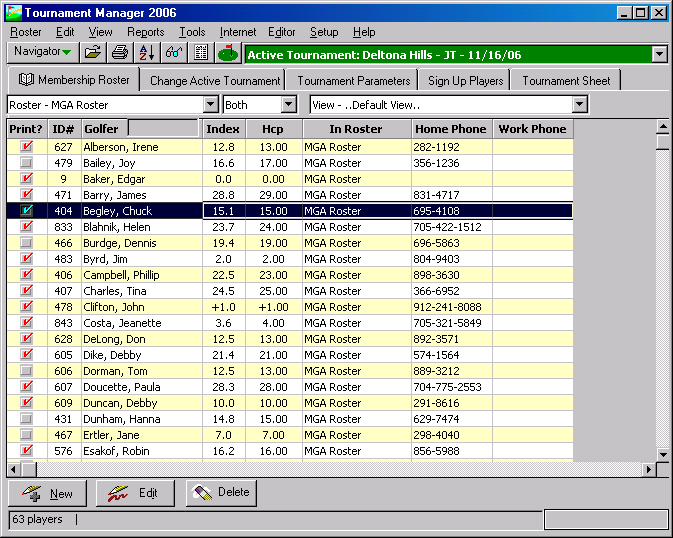 The tournament software automates the entire process. Most importantly, Tournament Manager is easy to use! Computer novice is assumed. You'll be up and running in 15 minutes. Makes planning a golf tournament easy! Option to track putts, fairways, greens, earnings, points, etc. Many pairing options! The tournament software can consider one, many, or all of the following parameters when building x-somes: Handicaps, Flights, Groups, Gender, Cart/Walk, and/or Preferred tee time. Select the appropriate pairing options and watch Tournament Manager go. For example, you could make Tournament Manager build simple foursomes requiring an A,B,C,D golfer in each foursome..........OR..........you could make Tournament Manager build a complex 2 men, 2 women in each foursome, each from a different club (group), pure with respect to walk/ride, considering each golfer's preferred tee time, trying to balance each foursome A,B,C,D - while trying to maintain equal team handicaps - while making sure that each successive event each golfer does not have the same partners. It would take days to do manually. Tournament Manager does it in a matter of seconds. Up to 9 grouping fields available. Use the group field to make Tournament Manager handle complex pairings. Example: Assume you're running a tournament with 100 golfers. 25 are professionals and the other 75 amateurs. You want to calculate 25 equal foursomes with one professional per foursome and the remaining three amateurs. Place all professionals in group 1, and all amateurs in group 2. Then mark "Balance Groups" and calculate pairings. This golf tournament software will assure that one professional appears in each foursome....while maintaining any other options you set. Tournament Manager can build x-somes considering gender, cart/walk preference, and preferred tee times. This golf tournament software even has an option to automatically avoid pairing husbands and wives together. 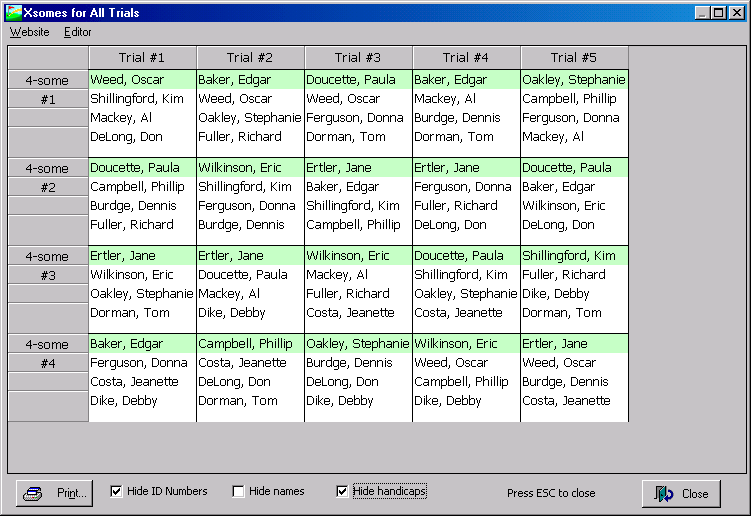 Equal x-somes: Calculates x-somes with total group handicaps as close as possible for each x-some. Balanced x-somes: Calculates x-somes with a balanced number of flights in each x-some. For example, a balanced foursome would produce an A,B,C,D in each foursome, while trying to maintain equal team handicaps. Flighted x-somes: Calculates x-somes with the same flight in each x-some. For example, a flighted foursome would try to produce an A,A,A,A in each foursome while trying to maintain equal teams. The next set of foursomes would be B,B,B,B, etc. Play with all: Calculates x-somes, making sure each golfer plays with a different set of golfers for each successive event. 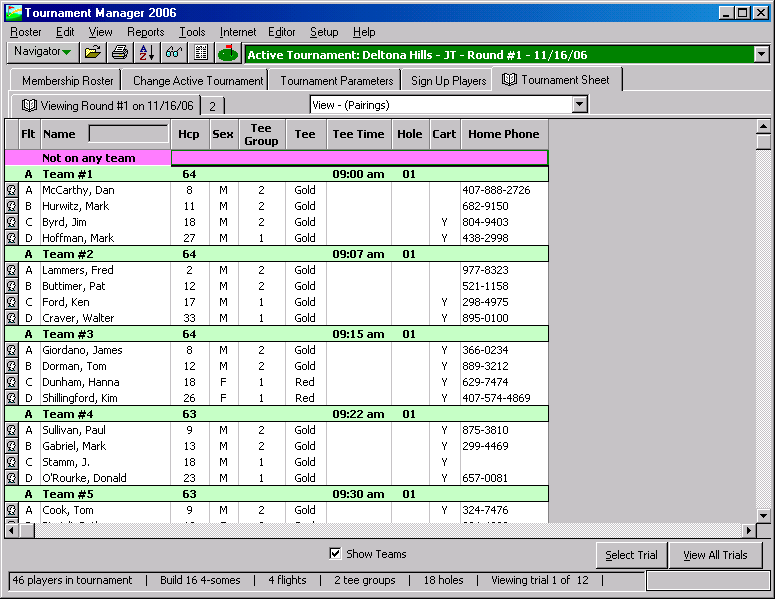 Tournament Manager calculates up to 24 events, or until each golfer has played with every other golfer. For example, if you had a group of 20 golfers that you wanted to pair into twosomes, Tournament Manager will calculate 19 events in which every golfer plays with every other golfer. Random Pairings: Calculates completely random x-somes, without regard to any criteria (handicaps, flights, gender, carts, etc.) See our free golf pairings generator. Each successive trial assures the same golfers do not play together! No repeats is guaranteed. Powerful manual pairing options. Allows you to lock any number of golfers on the same team. This allows you to manually build some teams (or parts of teams) and lets Tournament Manager automatically pair the rest. Flight golfers and teams automatically or manually. Up to 26 flights. Flight by any item you track, including index, handicap, scores, points, golfer's age, etc. Assigns tee times. Shot gun or regular start. Option to adjust handicaps for play from different tees. Calculates pars, birdies, eagles, skins, deuces, etc. Tournament handicaps calculated automatically. Handicap allowances can be adjusted by any amount. Odd holes, Even holes, etc. Stroke Play (best 18 holes, best front, best back, etc.). Customize standing reports to show practically any type of standings you can imagine. "Callaway" style handicapping. Handicap off one round using USGA Scheid, Peoria, and System 36 handicapping. Registration sheets, Sign Up sheets, Roster/Directory reports, Team sheets/labels, Cart Signs, etc. Score Cards reports. Many options allow you to customize the information you want to appear on each card. Team results. Dozens of preset reports allow you to summarize tournament results. Hole-by-hole or totals. Team standings may be flighted. 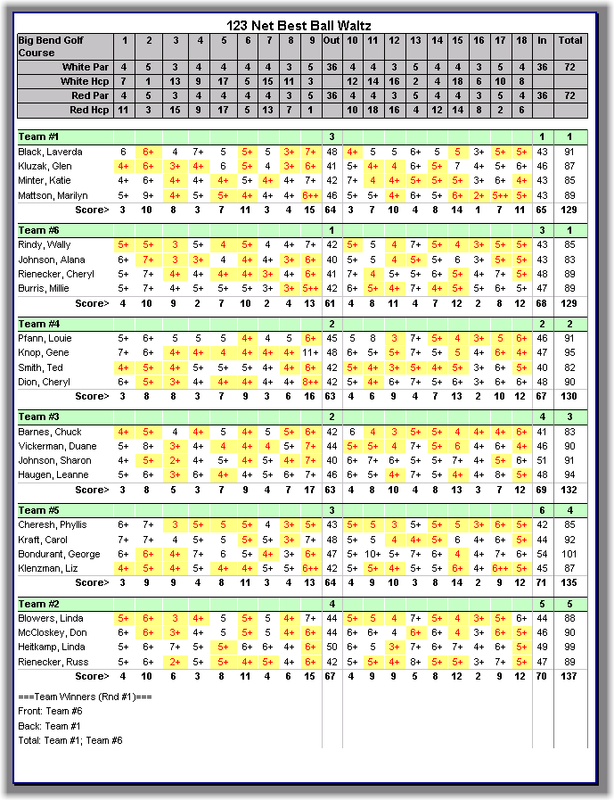 Individual results - track individual standings, including pars, birdies, eagles, etc. Individual standings may be flighted. Skins, Deuces, Course Results, Directories, Mailing Labels plus many more! Can't find a standard report that meets your needs? The custom report builder lets you build practically any type of individual and team results report. The number of types of reports you can build is infinite. All tournament reports can be customized to fit your exact needs. Option to print handicap or points on all reports. Reports can be sent to the printer, screen (preview), file, or exported to your website. An editor allows you to edit any report before printing. Reports can be altered, saved, printed, and retrieved later. Full screen input (just like filling out a form!). Backup/Restore utility to transfer data to other computers. Enter score cards hole-by-hole or totals only. Saves data automatically. Automatically loads the last tournament you were working with. Type ID# to move directly to a golfer. This lets you use the numeric pad exclusively. No need to remember file names or navigate through countless folders. Retrieve rosters and tournaments from a simple list. Integrates with our Handicap System and League Manager. Retrieves golfers and handicaps automatically. Plus much more! Call or email if you have questions. To see what's new in the latest release click here. For more detailed information call 1-919-460-7424. Satisfaction guaranteed. We have a lifetime money back guarantee on all software. There are NO annual fees (except for optional services). Tournament Manager runs on Windows 10, 8, 7, Vista, XP or Mac with Windows emulation software. Your order includes a free pack of 50 scorecards. Download golf tournament software immediately. After you place your order, you will receive an email confirmation with instructions on how to download. Personalized help and coaching. Our software is easy to use, so most customers never require help. But if you need help or advice don't hesitate to email or call. We are here to help. All products come with 1 year of email and phone support. More information. Free 1 year trial of Par Service. Mass email, online backup, and support. More information. Free help videos. Program comes with dozens of "how to" videos. It's the easiest way to see and hear how to do something. If you haven't yet seen the video demo of Tournament Manager, click to view tournament software now. You'll find this is the best tournament management program out today. I guarantee it! Try it. Compare it to the competition. I'm positive you'll be delighted. If not, send it back and we'll refund the entire purchase price. We have a lifetime money back guarantee. Order online or call 1-919-460-7424 to order by phone.